We made our own lava lamps during our first year or so of homeschooling but my youngest son does not remember. He was showing me a YouTube video a few weeks ago about someone who had made their own lava lamps and when I told him how we made ours and explained what we did he asked if we could that again sometime since he didn't remember it at all. I thought that sounded like a perfect hands on science lesson! To make a lava lamp all you need is an empty bottle (with clear sides), some vegetable oil, colored water, and Alka- seltzer tablets. He then added oil and began dropping small pieces of the seltzer tablets; watching the colored bubbles rise. Alec wanted to see if the temperature of the water made any difference so he began with a bit of HOT tap water and added some red and blue food coloring. Evan used water straight from the tap (at whatever coldish temperature it was) and added his oil straight away. he then put in a few drops of food coloring and watched the food coloring suspended in the oil for a bit before adding a piece or so of the tablets. As soon as the colored drops reached the water they fanned out and it was really neat to watch the blue and yellow drops combine. From there the boys played with the size of the Alka- seltzer tablet they added. Since we used small bottles a full tablet could not fit in and they had to break off pieces. Usually the larger the piece was the larger the bubbles and reaction. They tried adding food coloring to the tablet, or just dropping a few drops into the bottle to see where and how they combined. We often found that the coloring got trapped on top by the bubbles. Alec would drop many tablet pieces in one after the other and ended up with some really neat "tornado" effects. It was even fun to look in or put our hands over the top. We could feel the release of air and talked about the difference between chemical reaction lava lamps (like these) and the traditional heat lava lamps that they used to own. Alec tried shaking up his entire bottle (with the cover on) and then added a few small tablet pieces in. With the mixture almost mixed it was hard to see any reaction taking place and some of the tablet pieces actually stayed suspended in the oil section of the bottle. I'd bet they spent a good 30 minutes playing around-- it was great! Evan decided to add more oil and a bit more food coloring. 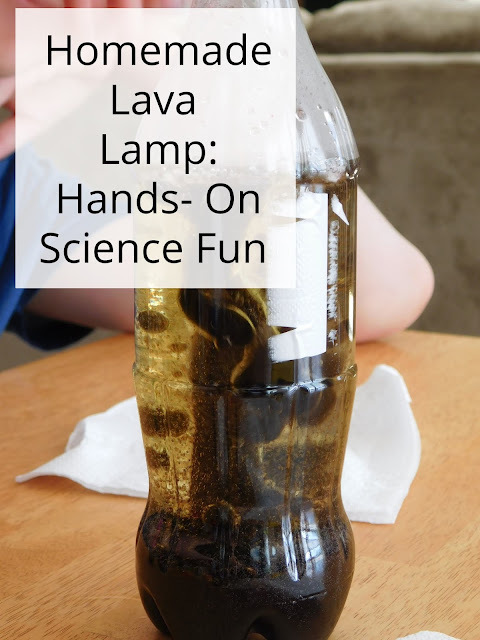 Have you ever tried playing around with making your own "lava" lamps? I find that oil and water experiments are often so much fun and my boys just love anything that fizzes so combining the two was double fascinating. My 90s teenage self is LOOOOVING this. I had a lava lamp in my room for years and it was one of my favorite things! I was so sad when I finally had to part with it! I never had one but I do remember my older sister had one for a bit and I thought I was unbelievably cool. My boys have all had a real lava lamp at some point; I was so surprised to find they were still around! This looks a fun experiment. So cool :) Thanks for sharing at The Wednesday Blog Hop.